immersion : one was the first in an ongoing series of long form, steady state “zones” created specifically as tone meditations for the living space. Gently immersive and especially effective at low volume, the non-dynamic nature of this space can support sleeping as well as creative states, reading and other functions where “music” is considered invasive. 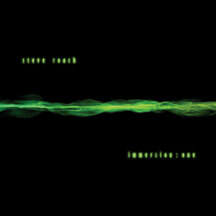 Purposely untitled, minimal in nature and sonically uninterrupted for 74 minutes, this “tone zone” series brings Steve’s years as a sound painter of deep subtlety to a point where the “brush” has only a few bristles and nothing more is needed.